Home » Posts Tagged "siberian cats"
Many of the species are declining population at alarming rates and some are even becoming extinct through our negative impacts on the globe and because of our deforestation, unplanned urbanization, and so on. Our negative impacts on the globe are forcing some species to move away from their natural habitats, and some are being forced to reduce population due to unfavorable conditions in the nature. Today we will discuss some of the cats that are facing drastic population decline and might face a significant risk of extinct if our negative impact on the environment continues. Below we will talk about few of such species of cats that are at risk of extinction. Snow Leopards (Panthera Uncia) are iconic cats that live in the extreme cold mountainous regions of Alpines, and sub Alpines in the Central Asia. Their population is sparsely spread over 12 countries in the grassy region of northern parts of Nepal and Bhutan, and vast areas of China, Mongolia and Tajikistan. It’s estimated that the number of Snow Leopards left in the world today is somewhere between 4000 and 6500. The main reason for the decline in their population is because of hunting. Their skin has been used for long time as traditional medicine in china and they are also hunted to save livestock from being killed. The temperate forests located on the eastern coast of Russia are the host to some of the rarest species of cats in the world. Two of the most endangered species of the world are the Amur Leopard and the Siberian Tiger. These species of cats are being forced to extinction because of several factors over the past few decades. 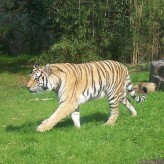 These tigers are capable of running at a speed of 40 miles per hour and leap over 19 feet vertically. The decline in number of these tigers is caused by declining number of prey due to pray poaching and deforestation in the area and through illegal hunting of cats. The beautiful spotted fur can sell for $0000 to $15000 a piece. They are also killed for their bones which is an ingredient for Chinese medicine. Scientists estimate that there are about 530 tigers left in the Siberia region today. Bengal Tigers (Panthera tigris tigris) has been classified as an endangered species since 2010 by IUCN. These tigers are available in India, Bangladesh, Nepal, and in Bhutan. The vast majority of these tigers is found in India, and CITES (Conservation on International Trade of Endangered Species), is talking with India to preserve these animals. The total number of Bengal tigers is about 2500 and they are decreasing in number sharply due to unavailability of pray to support their population. The skin of these tigers can be yellow to brown with black stripes. A male full grown tiger can be about 10 foot long including their tail, and an average tiger is about 3 to 3.5 feet tall, weighing from 450 to 500 pounds. The major diet for these tigers is variety of deer. jaguars (Panthera onca) is one of the largest species of cats in the world. They are about 4 feet long and weigh about 250 pounds. They are tan to brown in color with rings of black spots called rosettes. Jaguars once lived throughout the southwestern United States, including in the continent of South America and Central America. In the United States, most of their ranges were hunted and brought to extinction, only recently they are beginning to populate their usual previous ranges. Their habitat can range from dense forest, grass lands, and scrubland. Recently, the conservationists have been urging the federal wildlife officials to preserve the natural habitats of thee cats to protect these endangered species of cats. These are some of the endangered species of rare cats around the world. By focusing on the habitats of these species, reducing deforestation, and minimizing poaching of their prey, we could successfully restore these species and protect these species against extinction. The cat and prey populations will recover once we take necessary measures to limit the poaching of cats, prey species and manage the forests for logging more sustainably. Let Us Get You Some Free Stuff!